What Has Discovery Added To Star Trek Lore? Discussion in 'Star Trek: Discovery' started by Kane_Steel, Jan 14, 2019. I know I'm old school, but I actually miss being able to push the number buttons. I can't tell ya how many times I've called the wrong person or a stranger, because I didn't realize I had hit the wrong number on the touchscreen. I have a feeling that peoples are always gonna prefer tactile interaction with devices. Could be the reason why the Jelly-Bean Buttons were used on the Classic Enterprise. I also prefer tactile. I learned how to type in school. I don't need to look at the keyboard at all. But, if we replaced it with a touch screen, I'd be a slow poke, poking my way through, looking up-and-down, back-and-forth between the touch screen "keyboard" and the monitor. I'd hate it. Does the fact that we have simple holograms now mean that reality isn't canon with Star Trek? Maybe we've been rebooted. The world is a continuity error! The Mighty Monkey of Mim, JoeP, PiotrB and 1 other person like this. The one with all of the fancy details on it. TNG one is just a ball with a couple ships on it. Brand new models of this coming out in 2019. That's not what the new versions are going to look like though (not supposed to hotlink images either ). That same picture is featured on this page https://www.androidauthority.com/motorola-razr-v3-888664/ released in 2004. You all don't think about fact-checking each other instead of giving it likes? I don't need to check anything but, for the hell of it, I'm going to give your post a like. Can we all stop responding to Marsh and get back on the topic at hand? They gave us a logo for the Tellarites. Does this count as lore? JoeP, Turtletrekker, Lance and 1 other person like this. OK, I know you feel the need to be correct all the time, so I fixed my image. I essentially stated that there are BRAND NEW MODELS of that kind of phone coming out in 2019. And apparently you completely ignored the SAMSUNG model of a flip phone that I posted. 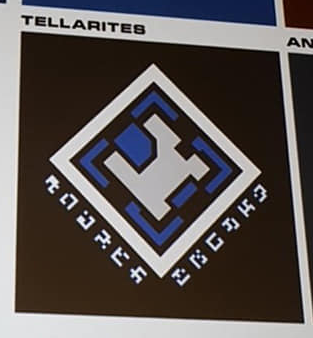 To get back on topic at hand, they gave us a logo for the Tellarites. Wasn't it seen in one of the MU episodes last season? I don't believe so. The first time I remember seeing it was in the season 1 finale. Ahh, I'm probably having another senior moment then. That does look to be the direction they're heading. Apparently, Enterprise is the only ship in the fleet that's had any problems. You know, he warned me. The damn holographic comm system. Tell Louvier to rip out the entire system. From now on we'll communicate using good, old-fashioned view screens. But I did say "generally". Cherry picking for instances for the exception does not disprove the general rule of thumb. Don't appearances generally indicate advancement? Only because we are culturally conditioned consider such things "advancement." And typewriters are coming back. Honestly, this misses the whole point of Star Trek tech and Star Trek lore. We're so lost in the weeds that the show itself doesn't even matter any more. The Mighty Monkey of Mim, PiotrB and Awesome Possum like this. I guess you can say as far as star trek lore is concerned is that the series adds more ambiguity to technology abilities of post-22nd century. Can someone think of any technological ability in the 24th century that we can say with confidence they won't be able to do on Discovery in some future episode? I'm stumped. I can't think of anything. Or we could not, and just talk about the lore the show has added just like the thread title asks before the thread gets locked again. Burning Hearts of Qo'nOs, JoeP, Unimatrix Q and 2 others like this. Star Trek tech has always been ambiguous. That is not new. And people have pointed out technological abilities and differences that have been ignored, so this discussion is circular and benefits no one. On topic, Discovery has added much to the lore, but specifically, I appreciate more depth to Spock, Sarek and Pike. 1. It's now adding a season-long arc that doesn't focus on a war. 2. It's adding more dimension to the 23rd Century. 3. It's added homosexuals to Star Trek. 4. It's added burritos to Star Trek. 5. It's added The Beatles and David Bowie to Star Trek. 6. It's added mushrooms to a franchise besides Mario. 7. It's adding another approach to producing Star Trek on TV. 8. It's added cool costumes. 9. It's added some great aliens to the crew. 10. It's added great insight into some people's true colors. Campe98, The Mighty Monkey of Mim, PiotrB and 6 others like this. Just having Number One show up adds gobs of new lore. Yeah maybe they won't be able to create a holographic crew member like the EMH doctor. I think they're capable of it though so I can't say with confidence that it won't happen. Ah well maybe someone else can think of something. Some lore "Mirror, Mirror" presumably was not the first cross-over to the mirror universe, exposure to Kelpiens and Airiam the robot, half robot, or whatever she is. Probably not going to do a whole lot with any kind of armor system, like Future Janeway had. Probably not going to see a phasing cloak or the like. I always figured that there had been other cross overs to the Mirror Universe. Androids are not exactly unique in the TOS era, so Ariam is not a stretch. Engineers having weird dreams about playing the drums for a Prince concert are now canon.